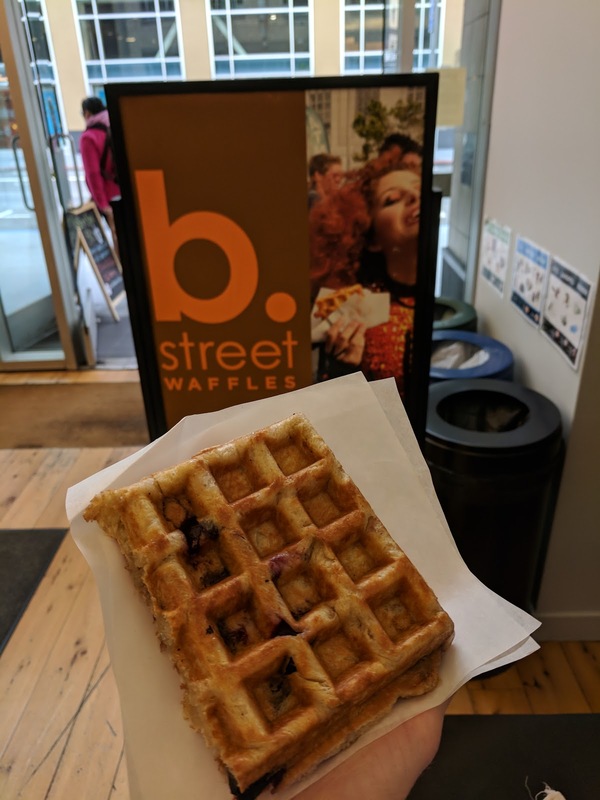 It has been a little while since I've updated my review for one of my absolute favorite businesses in San Francisco: b. street waffles. That doesn't mean I haven't been enjoying Gerald's waffles regularly, it just means I've been quietly taking notes, gearing up for a big update review, and here you have it, 2 years later. You can read the backstory in my original review introduction, so I'll not repeat myself this time, except to tell you, that these are, hands down, the best waffles I've ever had in my life. 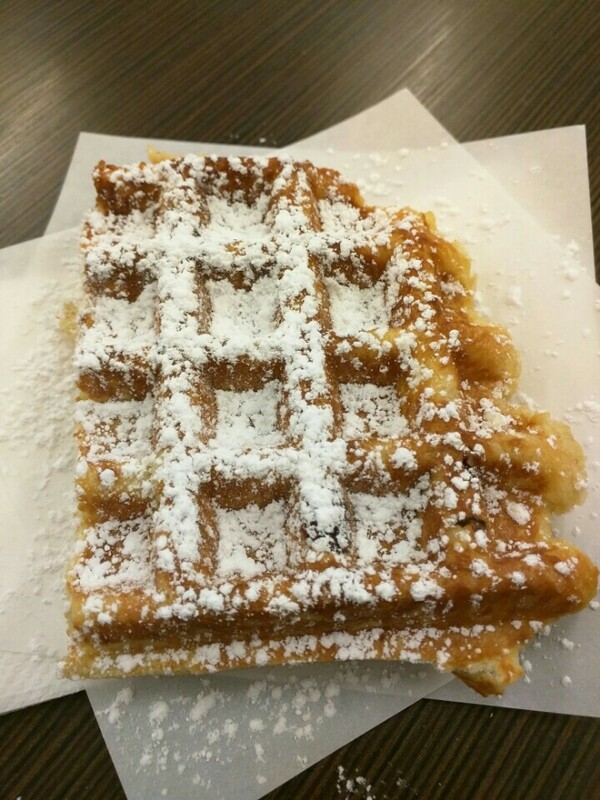 If you've never had a Liège waffle, you need to go discover one, as they are nothing like the American counterparts. The dough is yeasted, rich like brioche, and sweetened, and the sugar crystalizes on the outside, making them dense, doughy, moist, and crispy, all at once. 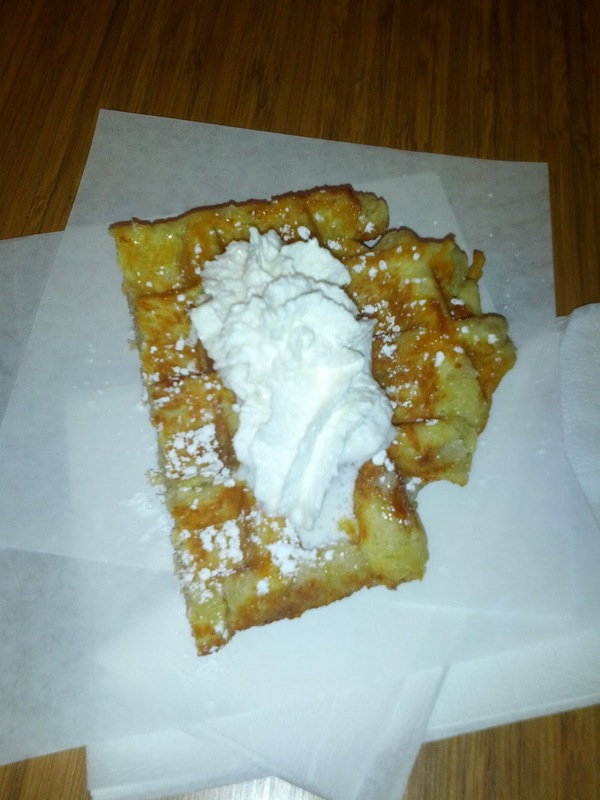 They are amazing, and b. street waffles has perfected them. I've included new reviews below, alongside the originals, categorized by flavor. 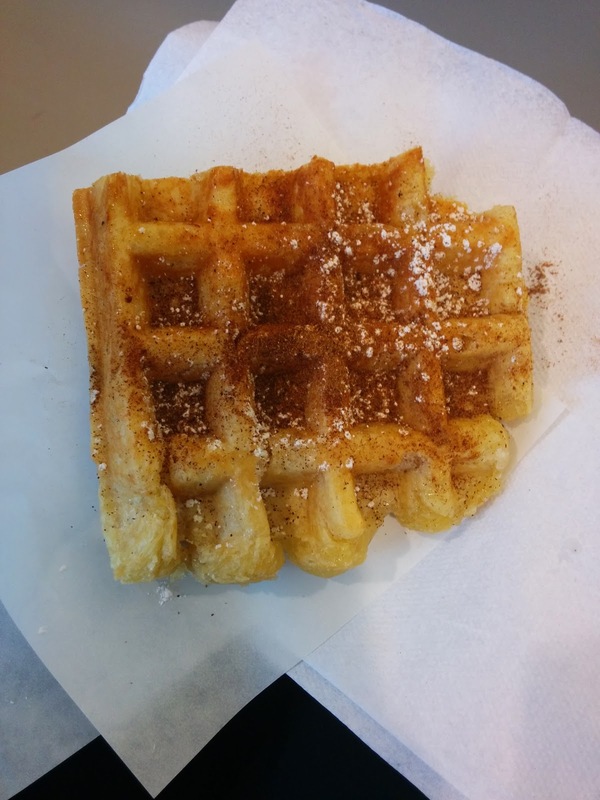 I discovered b. street waffles several months ago, when they were doing a popup at Capitol One 360 Cafe. Apparently they do free waffles the first Wednesday of every month. There was crazily no line, and um, I love waffles, so I eagerly wandered in. The idea behind the waffles is that they are street style. The ingredients are baked in, so you just grab one and go, no syrups, no utensils needed. They come in many flavors, from fruity (lemon blueberry, key lime, apple cinnamon), to sweet (vanilla, salted caramel, chocolate), to even savory (maple bacon). They also offer a seasonal flavor of the month. They are made with high quality, local ingredients: Straus for the dairy, Giusto's for the wheat, TCHO for chocolate, etc. And you can tell. b street mostly does popups around town. Whenever I've seen them, they are set up with their impressive, massive, heavy duty waffle irons, cooking waffles fresh to order. Each mega-waffle is then cut into quarters, a more reasonable size, and handed over to the eager recipient. Waffles are also available online, packaged up, and delivered, although obviously not fresh and hot, which seems like a lot of the point to me! b. street also does catering; they'll bring the waffle iron to your venue and bake them fresh, and I assure you, the aroma of the waffles cooking will add a touch to your event that you cannot achieve in any other way. Always drool-worthy! 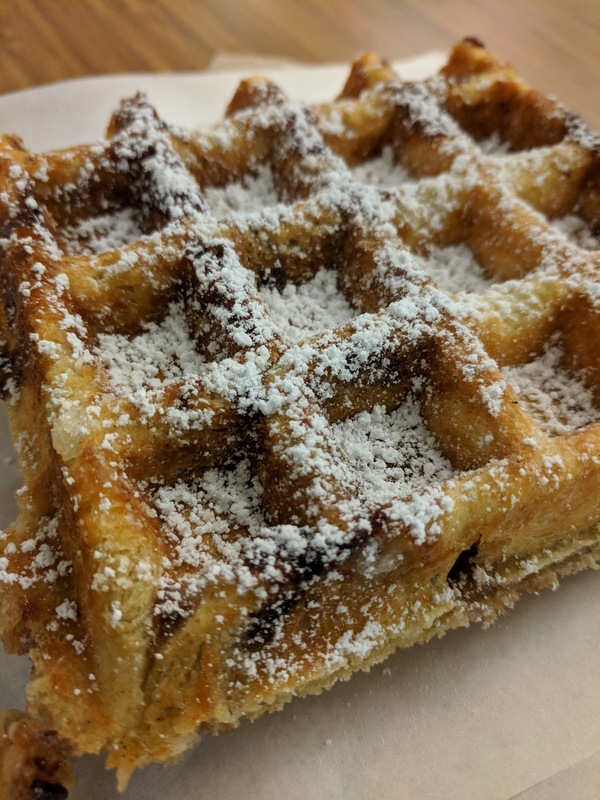 And, the staff have always been really friendly and personable when I've seen them, even when the line for waffles is crazy-long, they are always there with a smile. Whenever I spot them around town, I'm certain to try out the latest flavors, as they offer up a special monthly flavor every mouth, and they always sound amazing! Mmmm, waffles! 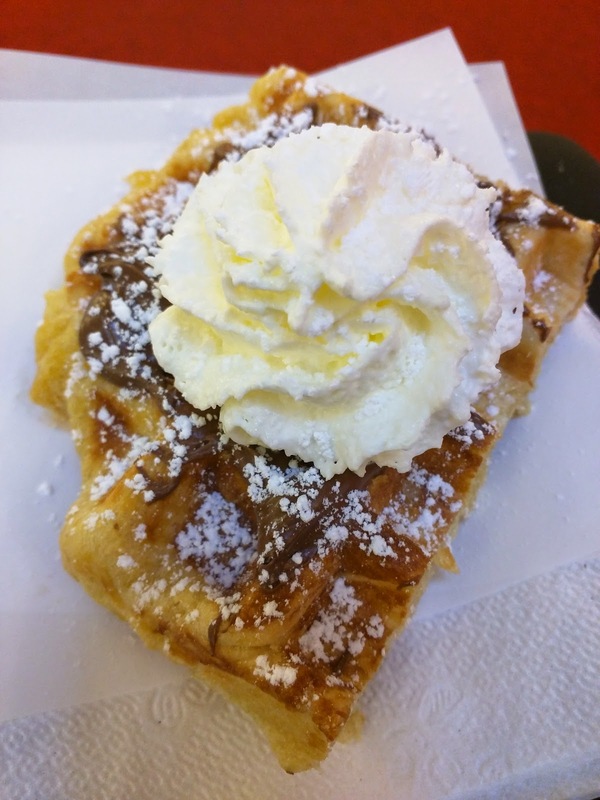 Classic Vanilla Waffle with Nutella, Whipped Cream, and Powdered Sugar, January 2015. 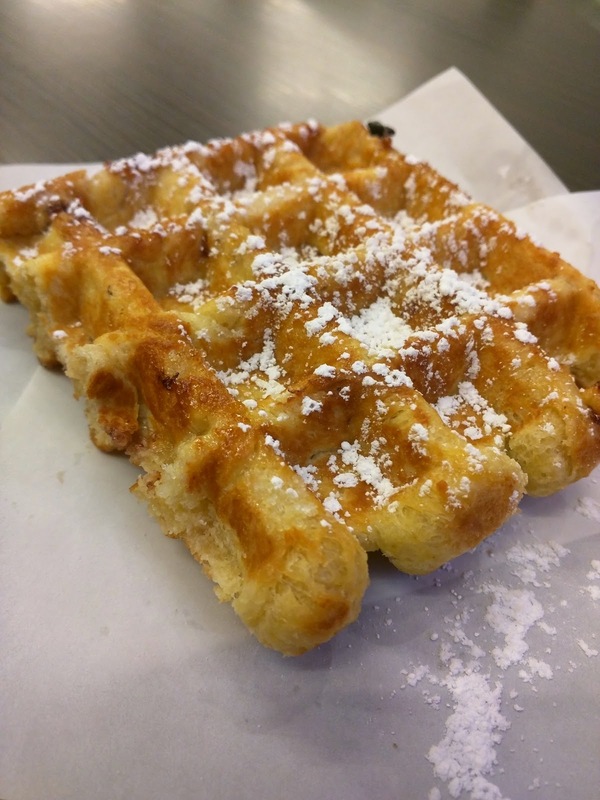 "The classic Belgian Liege-style waffle that dates to the 17th century made with pure vanilla." A simple vanilla waffle. “How good can that be?”, I thought to myself. Even though I know I don’t really like Nutella, I told Gerald to load it up, as I thought the plain waffle, since served street-style with no syrup, would be too boring. How wrong I was. The waffle demonstrated exactly why I am so in love with these waffles. Even a simple vanilla waffle from B. Street Waffles is perfection. It doesn’t need toppings. The inside was moist and doughy as always. The outside, perfectly crispy. The dough had a lovely sweetness to it, reminding me slightly of fried dough that I used to get at the fair in the summer as a child. The powdered sugar, and the sugar inside the base, caramelized the outside just a bit. Seriously, so good. As I said, I don’t really care for Nutella (I know, I know, the horror), and I wish I had left it off. The whipped cream melted into the waffle, which is a touch I always love, although a bit difficult to eat sans plate or utensils. Another winning waffle, although next time, I’d leave off the Nutella. Some things are better left alone. 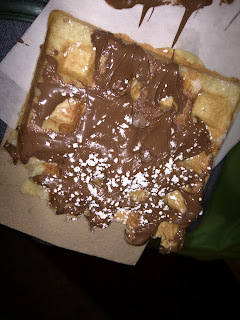 Vanilla Waffle with Nutella, August 2016. I think this was my favorite ever. Which is shocking, since it was just a vanilla base, and I’m not crazy about Nutella like the masses. The waffle was piping hot, and it melted the Nutella perfectly, so it became ooey-gooey. The vanilla base was everything I’ve come to love in a b. 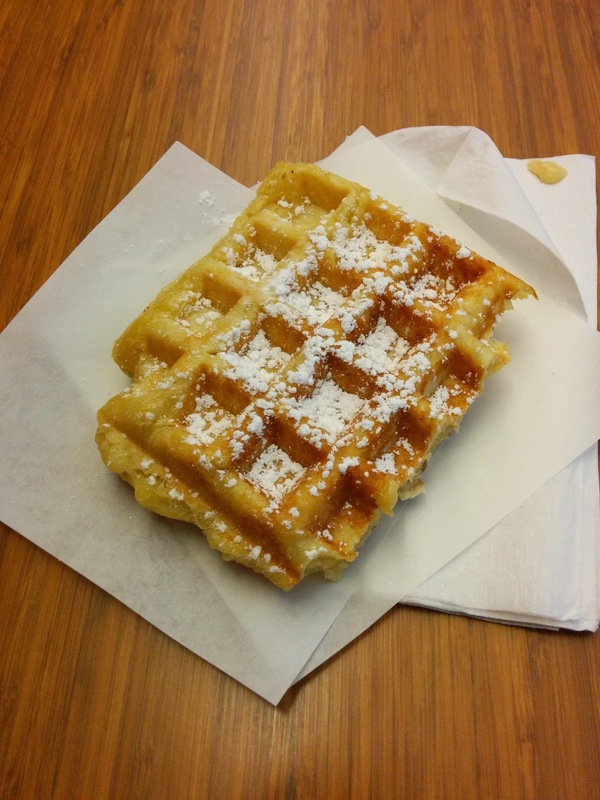 Street Waffle, dense, sweet, delicious. I devoured this, for breakfast, but, it really was one of the least breakfast appropriate waffles I've had. Add the whipped cream, and then, dessert it is. 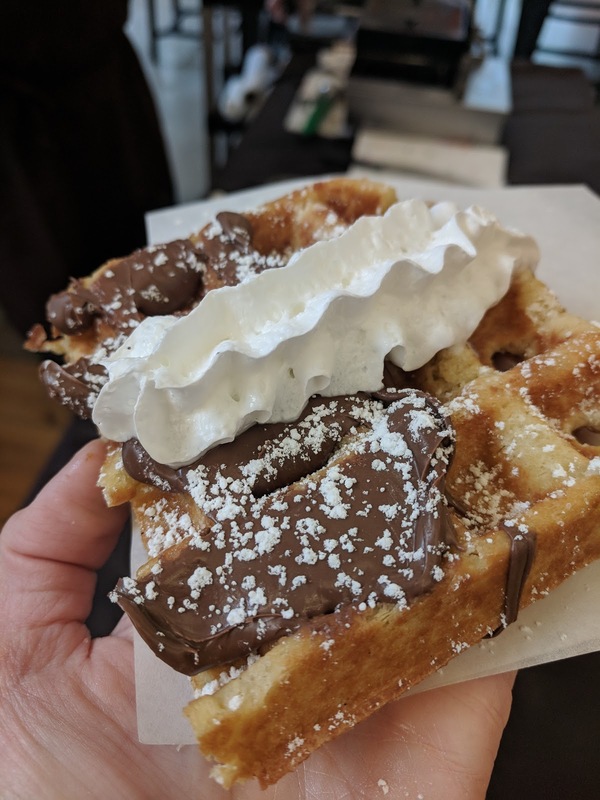 Vanilla Waffle with Nutella & Whipped Cream, August 2018. I'm glad I re-read my own reviews, because when I saw that the August flavor was vanilla, and I was horribly jet lagged, I planned to skip Waffle Wed. Them I remembered, "oh, wait, vanilla *isn't* boring ...". I jumped out of bed (ok, crawled, the jet lag was #real), and dragged myself to the cafe for waffles. The classic vanilla really is just perfection. Lofty, yeasted, sweet, caramelized exterior, and, when fresh from the waffle iron, the Nutella melts in all nice. I think next time I go just classic. Well, with whipped cream of course. Either way, you can't go wrong with this one. It represents b. Street at its finest. Classic Waffle with TCHO Dark Chocolate Sauce. I had this at a special event at the TCHO factory. It was a plain waffle, topped with TCHO dark chocolate sauce. 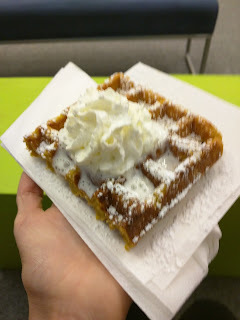 Since it was a huge event and b. street waffles was rapid fire handing out free waffles, it wasn't hot when I got it. Which is a bit sad, but it still had nice flavor to it, even the base waffle seemed to have some tang to it, which I always love. And I applaud their efforts at giving out waffles so quickly! "Inspired by weekends in Maine, these blueberry-infused jam waffles bring me back to my childhood." While waiting for my waffle, I learned all sorts of interesting facts about this one from Gerald. The “jam” he uses is made by a German company, specifically for baking. Rather than a normal sauce-like jam, it actually comes as pellets, that he adds to the mix. This way, the jam doesn’t add extra moisture, messing with his delicate recipe. (The same supplier also produces the caramel bits he uses for the salted caramel waffles). He takes his sourcing of perfect ingredients seriously, as obviously, it would be far easier to just get a mass produced product here in the US! Anyway, I was actually a bit disappointed by this waffle. It was still good, don’t get me wrong, but it wasn’t as magic as some others. Specifically, I think that it either cooked too long, or perhaps the dough didn’t rise as much as it normally does? It just wasn’t quite as doughy, moist, and light as I am accustomed. I missed the doughy interior. 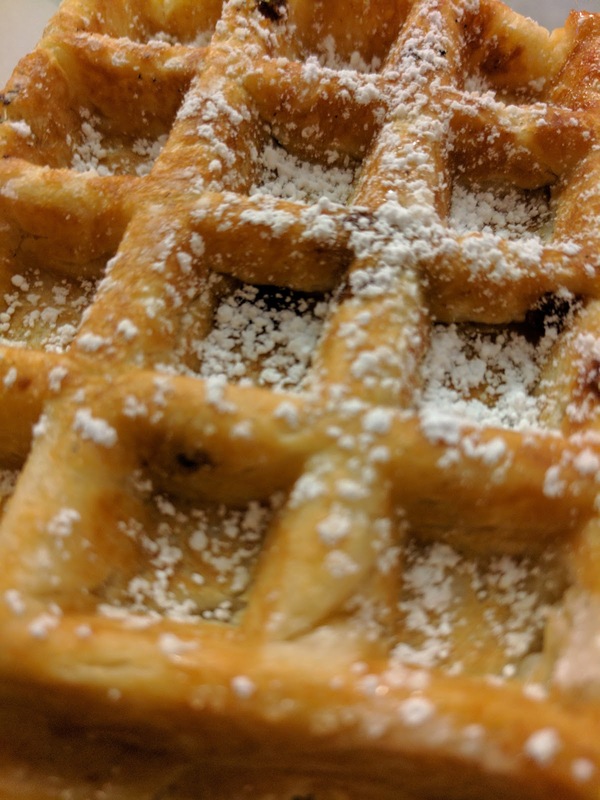 The blueberry bits were flavorful and tasty, but, I only had a few little bites in my waffle. I would have preferred more bits, or perhaps a spread on top to go along with it, as overall it was just a bit plain. A few years later, I had this flavor again, and, I really liked it. The blueberry jam bits are really extraordinary, flavorful little pops of, well, jam inside the waffle. They were super fruity, and made it quite breakfast appropriate. 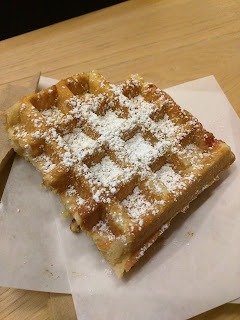 Raspberry Jam Waffle with Fresh Whipped Cream, December 2013. I think b. street waffles just gets better and better. This was December's seasonal flavor, and at first, when I heard "raspberry waffle", I admit I was a bit disappointed. Raspberries aren't in season, why would I want this? Where was the holiday appropriate gingerbread or peppermint? But, this turned out to be my favorite one so far. The best part was the crispy, caramelized outside. I honestly don't think I've ever had a waffle nail this so well. And yet, it was still moist and doughy inside. The batter was the same quality batter they always use, nice base flavor. It was studded with bursts of a very delicious raspberry jam. And then, homemade fluffy whipped cream on top. Such a winner. Finally, I agreed with the street style. It truly didn’t need anything else, as it was absolutely perfect like this. No syrup, no fork, no extra sauces needed. The only that was needed? Another, as this disappeared far too quickly. Raspberry White Chocolate, August 2015. Raspberry came in the form of the little jam bites like he uses in the blueberry waffles. They were flavorful, delicious little pops of intensity and sweetness, but, there just wasn't enough of them in the waffle to really taste unless you sought one out. I didn't taste any white chocolate nor see any chips either. This was one of my least favorites, as it just seemed plain. I wanted more raspberry. I wanted any white chocolate. I wanted whipped cream. I wanted ... something. The waffle itself also wasn't quite as crispy, and the dough not as sweet as I am used to. 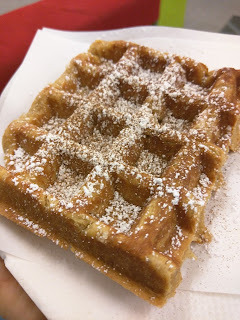 Apple Cinnamon Waffle, March 2014. "A Mom’s favorite, the classic American mixture of apple pieces and organic cinnamon"
I somehow missed out on waffle Wednesday in January and February. But, March rolled around, and I finally wasn't busy on the first Wed of the month, so I braved the cloudy weather and trekked to Capitol One 360 Cafe. The March offering was apple cinnamon, a bit of a strange choice since I associate apples with fall. But it was described as being like apple pie, in a waffle. Chunks of apple, organic cinnamon. Um, yes! The line this time around was longer, and seemingly slower, than usual. But, I've grown to love b. street waffles, and I knew it would be worth the wait. The apple spice aroma drifting through the crowd was a tease. But such a delicious smelling one. The waffle was dense like always, moist inside, slightly caramelized on the outside. Hot and fresh. There really is nothing like a waffle literally right out of the waffle iron. Even the fanciest SF brunch place can’t beat this, as there is a fair amount of time between waffle leaving the waffle iron, being plated, and brought to you. 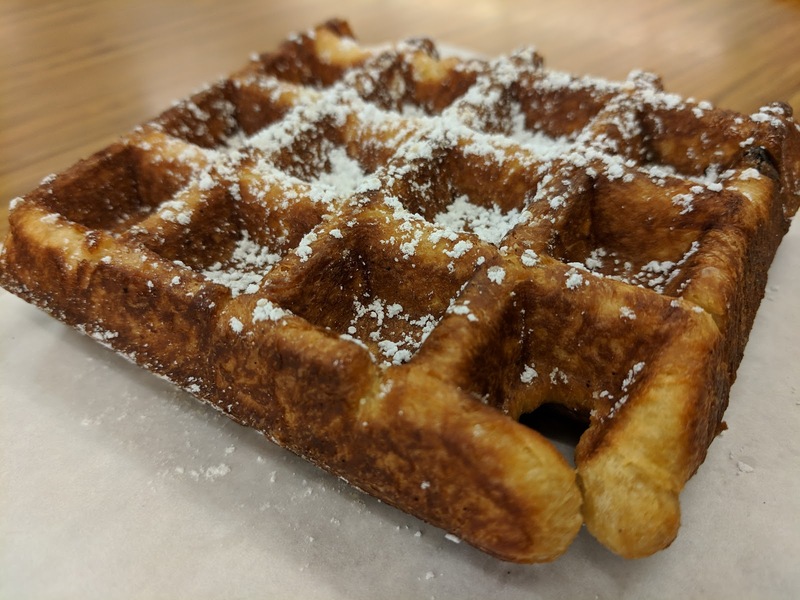 At Capitol One Cafe, only a minute elapses between it being plucked from the waffle iron, and delivered to your eager hand. 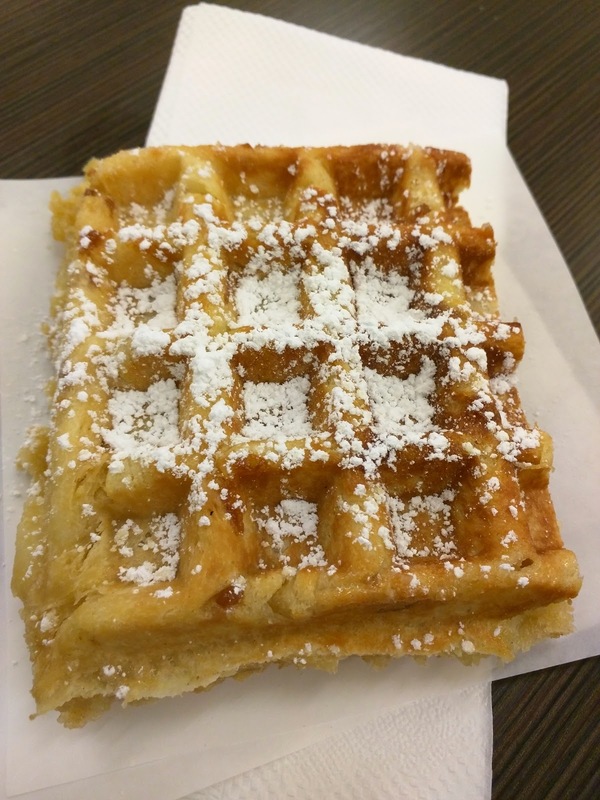 I didn’t really taste much apple, nor find many chunks, but the waffle was super moist, I think due to the apple. Powdered sugar was sprinkled on top, which melted a bit and caramelized even more, and I added extra cinnamon and nutmeg from the coffee bar to amp it up a bit. Perfect for a slightly gloomy day, as it was warm, comforting, and would be a perfect fall treat! Apple Cinnamon Waffle, September 2014. September rolled around, and the apple cinnamon returned, this time, totally seasonally appropriate. I am a broken record when describing the waffles, but it is worth repeating: these waffles are just amazing. Incredibly moist, dense, flavorful batter. Slightly caramelized on the outside. Piping hot. And this time, loaded up with little chunks of apple, which provided great bursts of flavor. I again added cinnamon from the coffee bar to amp it up just a bit. Lemon Zest Waffle, April 2014. And the monthly flavor for April: Lemon Zest! I'm not even that big of a fan of lemon, but I have learned to just trust b. street at this point, and I'm glad I did. This waffle was perfect, as always. Seriously, exactly what all waffles should be. It was hot and fresh, the outside crispy and caramelized, the interior moist and dense. The lemon added a zing, but didn't overwhelm. Powdered sugar sprinkled on top, optional, added a bit of extra sweetness, and I definitely would recommended adding it. Whipped cream might have been even better. I really can't get over how amazing these waffles are, and the street style has really grown on me. I originally wanted syrup, but that is just because it is what I was used to, and I can safely say now that these waffles are perfect as is. And eating without a fork and knife is obviously much easier! To be honest, I didn’t taste any ginger, and I was expecting a zing from it. The lemon was also very subtle, so there wasn't much overall flavor here. 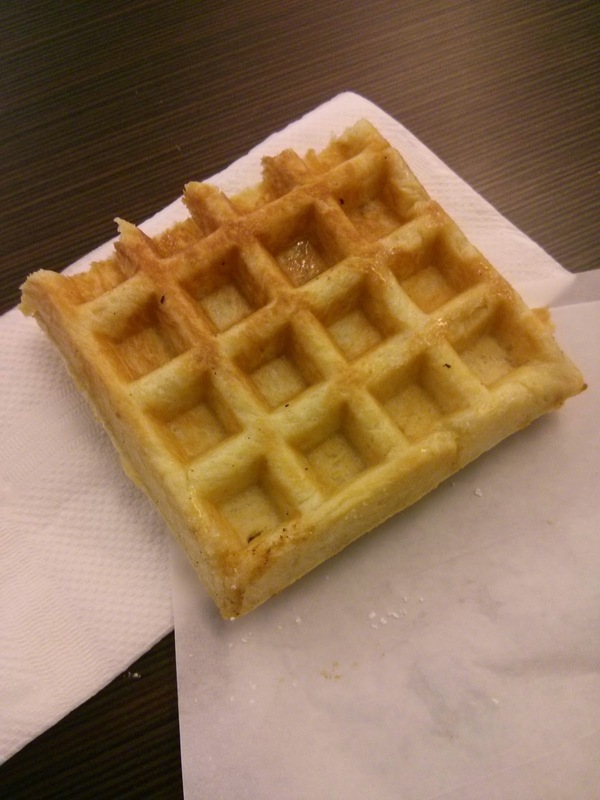 My waffle wasn’t quite as dense or doughy as I’ve come to expect, and, it had almost a slightly burnt flavor. This was one where I wanted something more, some syrup, some whipped cream, something, to just amp it up a bit. I’m being hyper-critical though, as I’ve come to expect absolute perfection from b. street. Even this, one of the worst I’ve had from b. street, is far better than any waffle I’ve had elsewhere! 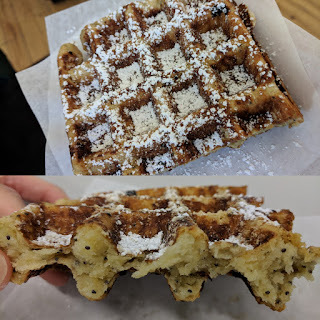 It had been a while since I went for a lemon based waffle, again, lemon is not usually my flavoring of choice, but when it came up again with poppyseeds, literally the day after I had an amazing lemon poppyseed Bobo's bar and loved it (review coming soon! ), I couldn't resist. The lemon and other citrus accents here were very subtle, from fresh fruit and zest. They gave a slight zing and acidity to the waffle base, but not in a way that shouted out "I'm LEMON!". The poppy seeds gave a bit of texture and crunch. Overall a fine waffle, not necessarily a flavor I'd pick, and one I really wanted some whipped cream and fruit topping for! Finally, a flavor I haven't tried before! Cranberry, seasonally appropriate for November, since, Thanksgiving. 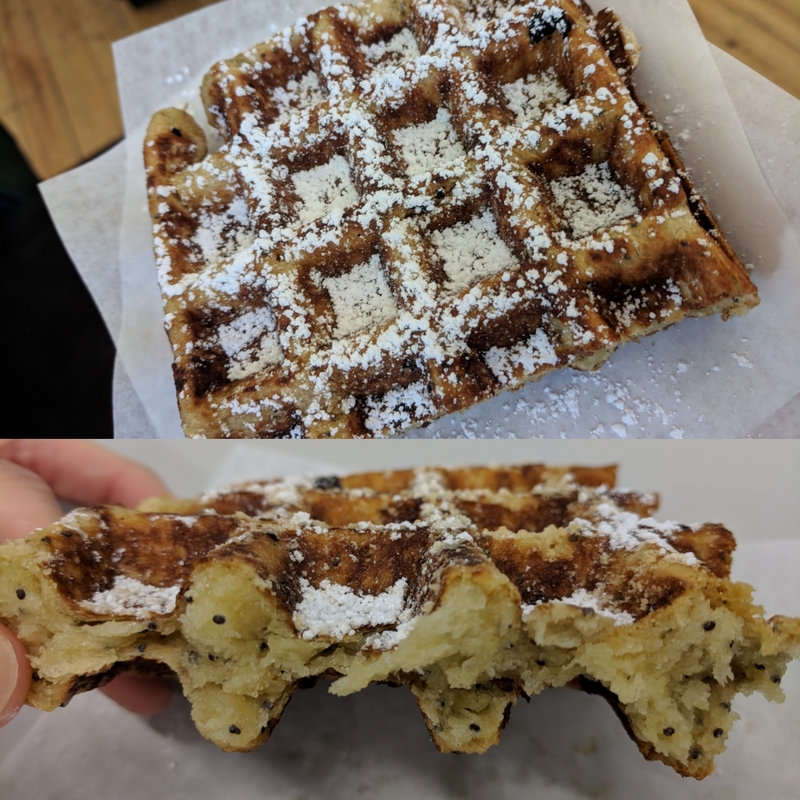 The waffle was quite plain, besides the whole cranberries inside. This allowed me to really, really appreciate the quality product that is the base. Slightly sweet, doughy, moist, quite tasty. Nicely crispy on the outside. Overall, good, although I'd never pick cranberry, and I did want a little more oomph of some sort ... whipped cream would certainly work, but, then again, when would I ever turn down whipped cream? Cranberry Orange Cinnamon (November 2017). This waffle was a shocker to me. I don't *really* like cranberries (usually dried cranberries are hard little bits inside of things, as disappointing as raisins ...), I don't care for citrus in desserts (I know this was "breakfast", but come on, its a decadent waffle), and the cinnamon addition sounded a bit muddled. But you know what? This was one of the best b. Street Waffles I've ever had. The cranberry was awesome. If this waffle was wine, I'd say it was "cranberry forward". The first flavor, the first bite, it was cranberry. Slightly sweet, slightly tart, and a great pop of soft fruit. No hard little raisin-like bits here. And then, on the finish? Orange. Cranberry orange *is* a great flavor match, and the orange carried through into the next bite. I loved it. The cinnamon was very subtle, just a slight "holiday spice". I couldn't devise a better waffle for the November and December holidays. It made me want to have a holiday party, just so I could bring b. Street Waffles on site to do holiday waffles. Cranberry White Chocolate (September 2018). After my surprise liking of the previous cranberry based waffles, I was excited to see cranberries make their appearance early in 2018, the September special flavor! And, sorry folks who hate it, I really do like white chocolate. This however was not a favorite for me. The cranberries were dried, exactly the reason I don't really like raisins or cranberries, just hard little things that I don't like the texture of. And the white chocolate, like the previous white chocolate waffle I had, was melted and incorporated into the batter, rather than added as chips that would result in little pockets of white chocolate meltyness (Gerald said that doesn't actually work out), so the white chocolate was just there for sweetness, rather than the more forward nature I wanted. I know I keep saying "this was my favorite", about so many different b. street waffles. The problem is? They just keep getting better. 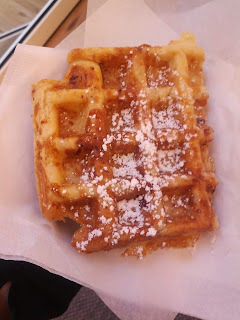 The waffle itself was classic b. street, crispy exterior, dense, rich base. Gerald used fresh local cherries (picked up from a market in Sonoma! ), painstakingly pitted them all, and put huge chunks into the waffles. It created a very different experience that all the other fruit waffles that used dried fruit or flavored chips. Big juicy berries. So sweet, flavorful, and a different texture inside the waffle. I desperately wanted to garnish this with some whipped cream and more fresh cherries. That would be even more incredible! Pumpkin Spice Waffle with Fresh Whipped Cream, October 2013. The seasonal flavor for October was of course ... pumpkin spice. 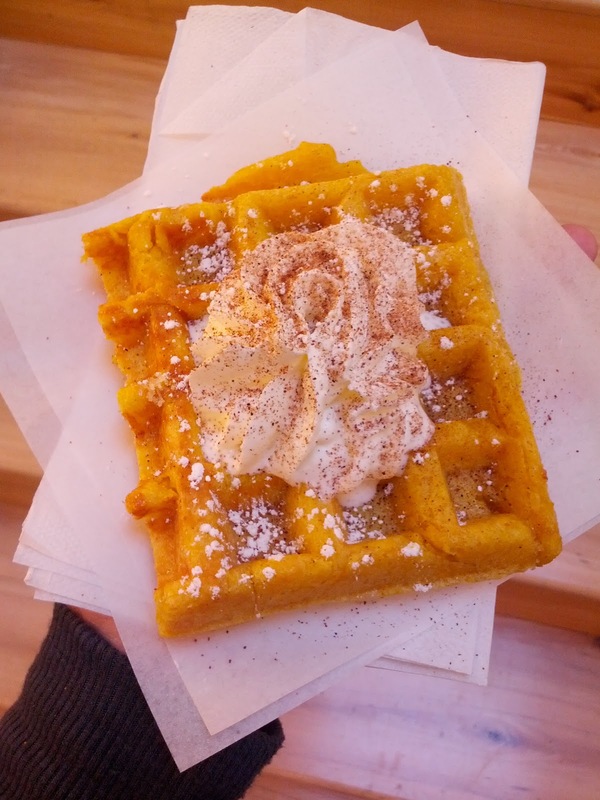 I was already sick of everything being pumpkin spice when I headed in to get the waffle. Now, I love pumpkin, I love cinnamon and nutmeg, but wow, mid-September hit and it seemed like everywhere I turn everything is "pumpkin spice". And in most cases, that just means a heavy hand with nutmeg, making things taste like soap. So let's just say I approached this with apprehension. I shouldn't have been worried. It was wonderful. Served hot and fresh directly from the waffle iron. The pumpkin puree in the batter kept the whole waffle very moist. The cinnamon and nutmeg spicing were present, but not overdone. I would have like it to be a bit more crispy on the outside, but that is really just personal preference. The last time I had a b. street waffle, I noted that while it was good, I wanted maple syrup. This time, fresh whipped cream was offered on top. Not quite syrup, but still something to push it over the top. And that it did. It was the icing on the cake ... er, the whipped cream on the waffle :) Fresh, real whipped cream can be such a perfect treat sometimes. This was creamy and, I have no better way to describe it, it REALLY tasted like cream! Luxurious mouthfeel, yet slightly sweet. It melted into the waffle, making it even more moist. It was also sprinkled with powdered sugar, and I added a little extra cinnamon and nutmeg from the coffee bar. I quite enjoyed my treat, and look forward to trying out next month's special flavor! Pumpkin Spice w/ Whipped Cream. October 2015. I'm somehow part of the population that doesn't go crazy for pumpkin spice. 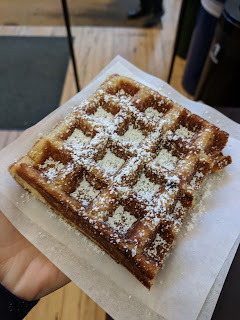 Still, I missed September Waffle Wed because I was in Paris, and July Waffle Wed because I was in New Hampshire, so I really wanted to make it to the October day, even though I wasn't super excited about the flavor. The waffle was about what I expected. Moist, not too strongly spiced, sorta pumpkin-y. Just not my favorite. I did like the crispy edges as always. I also loved the whipped cream. He must make fresh whipped cream. It always has an incredible flavor of fresh cream. I was really torn about the whipped cream though. 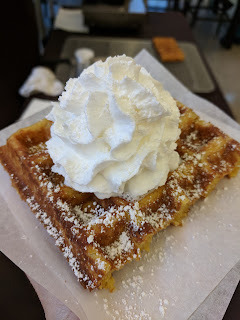 I loved the whipped cream, but, I almost thought it took away from my waffle, as it melted quickly, and destroyed the crispy exterior that I so love. But I loved the flavor and creaminess of it. Really, I just wanted a big bowl of the whipped cream! Anyway, overall, this was fine, but not ever a flavor I really love. Pumpkin Spice w/ Whipped Cream. October 2017. 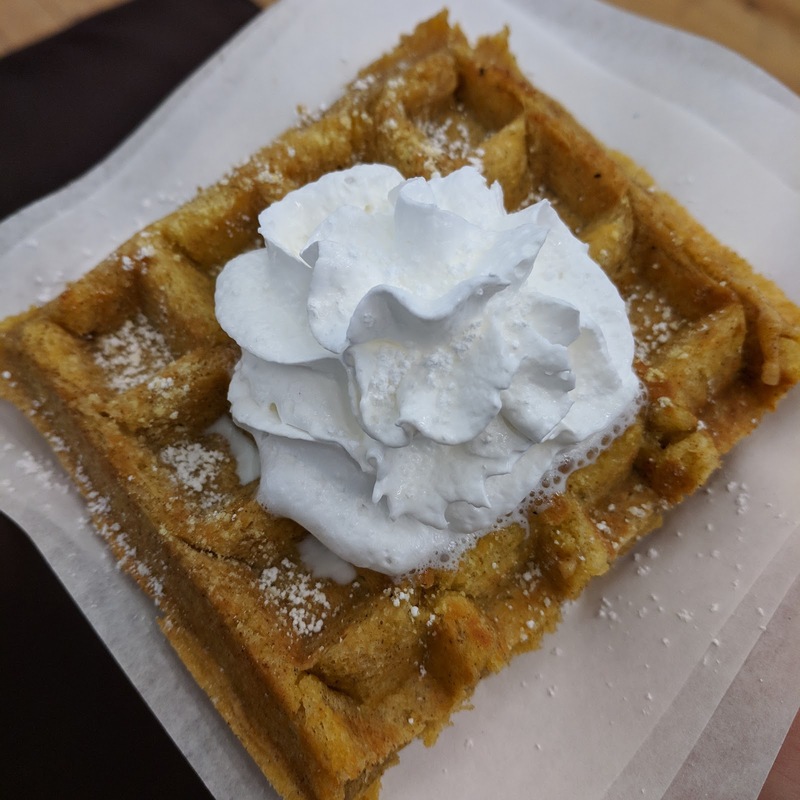 Another October, another pumpkin spice waffle! As with last time, I wasn't super excited about the pumpkin spice flavors (even though very subtle), as I just am not a pumpkin spice lover. They smelt great though. I think the pumpkin also makes the batter a bit more moist, so it was less crispy than some other versions, which, depending on your preference, may be a positive or a negative. Overall, a great one for pumpkin spice fans. And, big thank you to Gerald for the *very* generous whipped cream topping. Another year, another #pumpkinspice season. I've noted before that the pumpkin spice waffle is a bit softer style than the others, but this time was particularly true, due to a fairly amusing incident with a smoke alarm (! ), and the need to reduce the temperature of the iron. It wasn't a bad thing, just different, not the signature crispy style, instead, it was more soft, like ... a pancake, but with pockets. The pumpkin and spice flavors came through nicely, and as always with this one, I sprinkled extra cinnamon and sugar on top for extra goodness. Still not my favorite flavor though, I am just not a pumpkin spice girl! And another new flavor: gingerbread for December! I'll be honest - gingerbread isn't a flavor I get excited about. Not actual gingerbread, nor gingerbread cookies, gingerbread lattes, etc. But, as always, this choice was very seasonally appropriate. And ... I liked it! The gingerbread aspect came in the form of a subtle, sweet, deep molasses flavor. It added just a bit more interest to the base than the usual sugar. The waffle itself was an example of a perfect b. Street Waffle, the doughy, dense, yeasty interior just gets me every time. Gingerbread came back. And this time, it came with whipped cream! This was in the top 3 all time best b. street waffles. It didn't scream "GINGERBREAD!!!" or "OMG TRENDY SEASONAL ITEM!!! ", instead, it was just pleasantly spiced. It was really moist inside, almost like it had pumpkin puree or something in it, but I don't think it did. But outside? Perfectly crispy, slightly caramelized from bits of pearl sugar, just, well, perfect. Definitely a favorite, and I really enjoyed this one. Last time I had this, I proclaimed it top 3 b. Street Waffles ever. 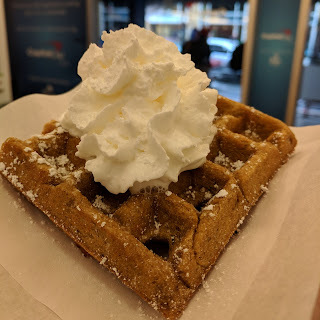 So when I saw the December flavor was gingerbread again, I knew I had to make it to Waffle Wed. I moved my meetings. I skipped my fitness class. I even ... walked in the rain. For those of you who know my feelings on rain, you know how extreme this is. And? IT WAS WORTH IT. Definitely, definitely one of the absolute best b. Street Waffles ever. For this waffle, it is all about the flavor. Deep flavor from molasses and honey. A good hit of ginger. Just a little nutmeg and clove to round it out, but not dominate. It is spiced in just all the right ways. Pleasant, not dominating. The waffle was a bit softer than normal, as Gerald had to turn the waffle iron down due to a fire alarm issue a few months ago (! ), so it wasn't quite as crispy and caramelized as time's past, but, it worked fine here. Softer style reminded me of actual soft gingerbread cookies, or gingerbread cake, and that is not a bad thing. Particularly when loaded with whipped cream. 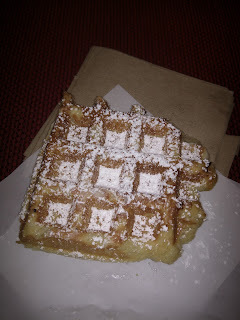 Really a fabulous flavorful waffle, and one I'll continue to go out of my way for, every year. "Real pieces of bacon drizzled with maple syrup". The waffle was hot and fresh, served right out of the waffle iron. This was a big selling point. It had a subtle bacon flavor due to tiny chunks of bacon throughout, but it wasn't in your face bacon. I didn't really taste any maple however, which is where it fell flat. I like the idea of the grab-and-go, flavors-cooked-in, but this didn't quite deliver. 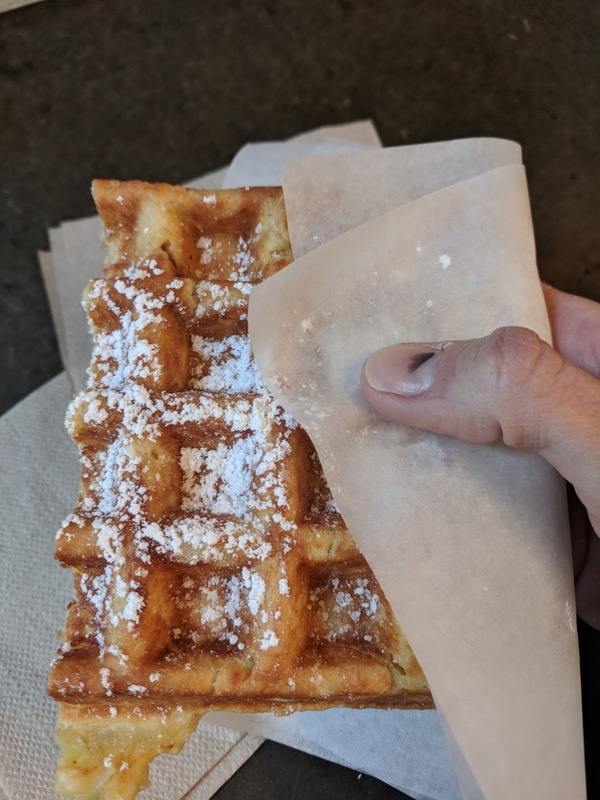 The super fresh waffle was nice though, it had a good crispy exterior while staying very moist, and the batter was clearly quality. I'll definitely try another flavor. 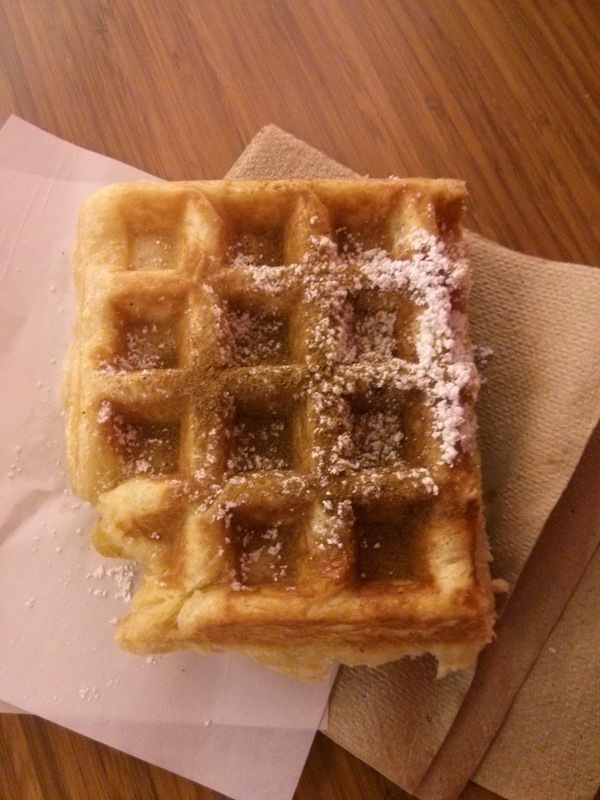 Update, 11/13: Another event, another maple bacon waffle. And this time, I really loved my maple bacon waffle! It had plentiful chunks of bacon in it, and the maple flavor also came through. The powdered sugar on top added sweetness and flavor, which I really appreciated. Since I remembered wishing it had syrup last time, I drizzled some honey on it, since that was the closest substitute I had available, but that really didn’t work. I shouldn’t have messed with it, it was good on its own. Besides the great flavor, my favorite part was that it was nice and caramelized on the outside, yet moist and doughy inside. A very tasty waffle! Toasted Coconut Waffle, May 2014. Starting to get summer-y ... the May flavor was Toasted Coconut. 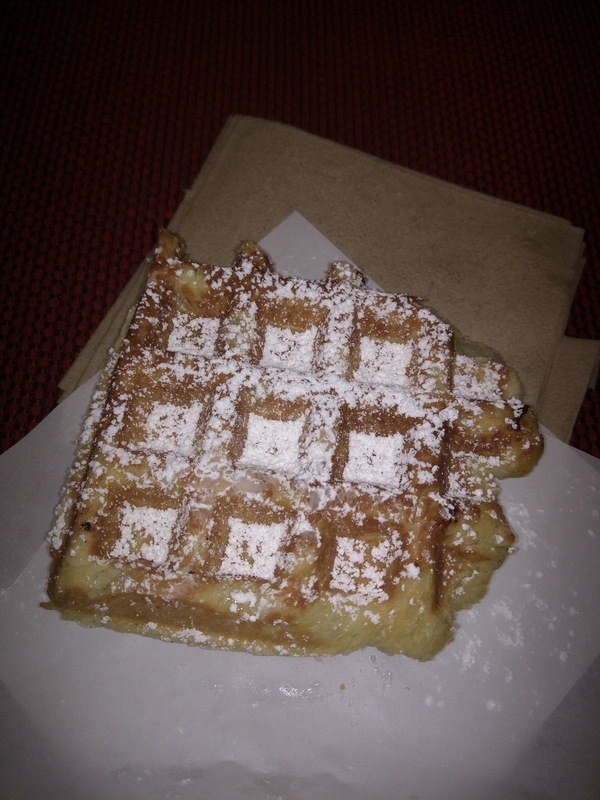 This was my least favorite waffle from b. street, for two reasons. The first is the flavor; I don't think I could have identified it as coconut if I hadn't been told there was coconut inside. The coconut flavor was just not strong, although my waffle did contain a few shreds of toasted coconut. It was very plain. The second was the consistency. It was hot and fresh, as always, but it lacked the crisp outside that I love so dearly. I think it was pulled off the waffle iron just a little early. Inside was doughy and moist, as always, but I was missing the crisp exterior. I still enjoyed my waffle, don't get me wrong. 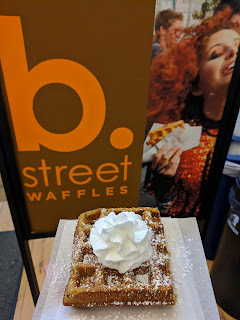 The base flavor of their waffles is so good that even a plain waffle from b. street is delicious, but, I when promised a coconut waffle, I want to taste the coconut. And although the outside texture didn't live up to their standards, it was still better than any waffle I've ever had anywhere else. 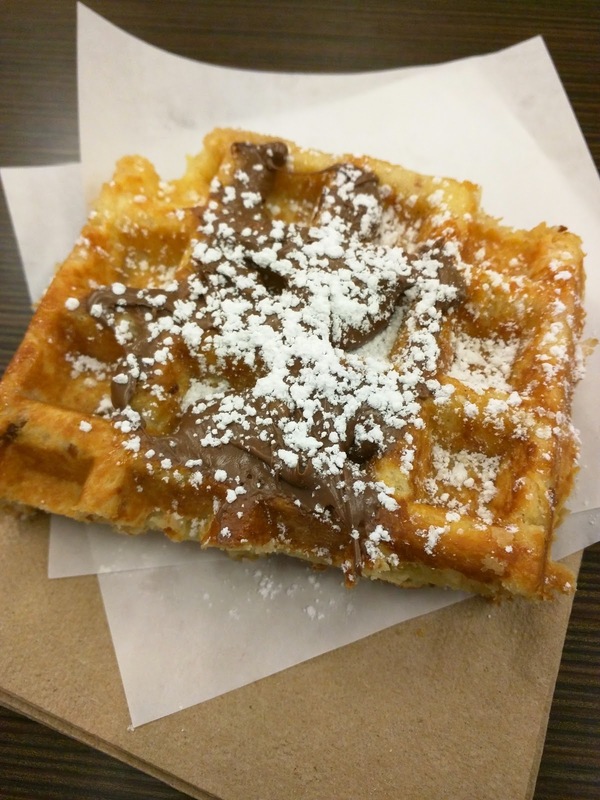 Toasted Coconut Waffle + Nutella, May 2015. A year later, May again brought toasted coconut. I wasn't super excited for it, since I remember it not being one of my all time favorites. This time however, it was awesome. To be fair, it still didn't have a very intense coconut flavor. There were some shreds of coconut inside, and I think he said it was made with coconut milk and coconut sugar? 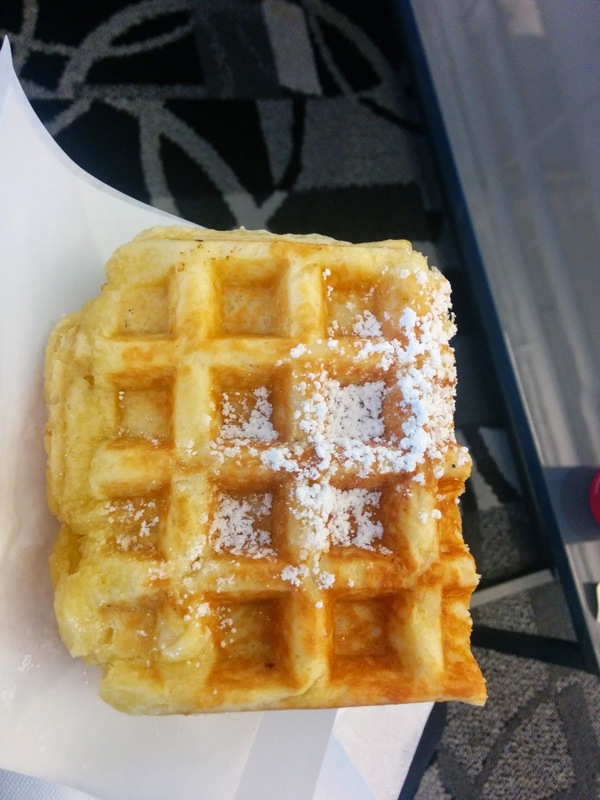 It didn't need the additional coconut flavor, though, the base waffle itself was magically perfect. Super crispy exterior. Moist, dense interior. Sweet, but not too sweet. It didn't need anything. This was exactly the sort of b. 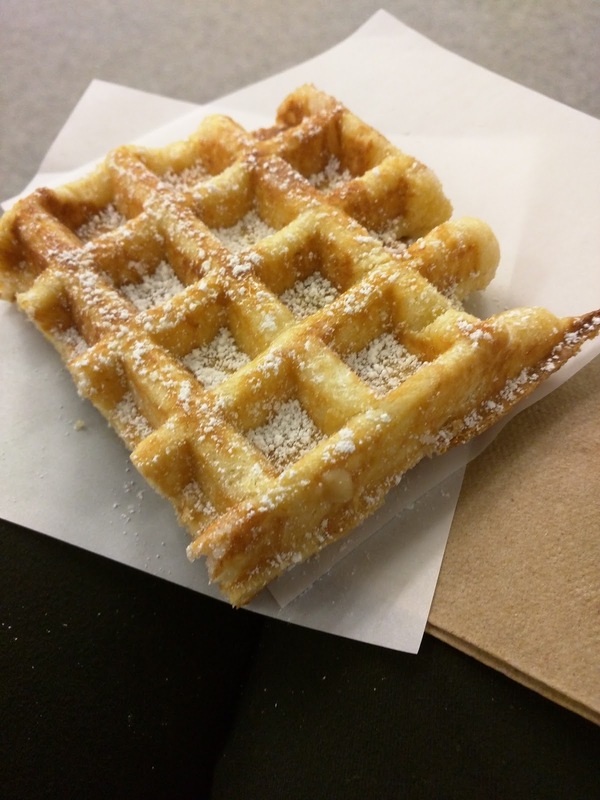 Street Waffle made me originally fall in love with them! He offered Nutella to spread on top, which I agreed to, but to be honest, I think I might have liked it more without. 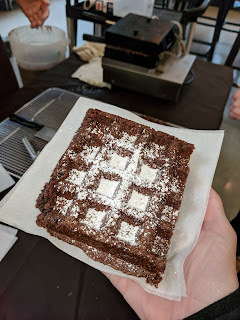 The Nutella was great, don't get me wrong, but the waffle itself was just so near perfect on its own that it almost took away from it. Anyway, an example of how well executed these waffles can be! Third time is the charm? Nope. This time, the coconut waffle did have plentiful shreds of coconut inside, but, I didn't really care for that aspect. The shreds were a bit strange to have mixed in, texture-wise. This was my least favorite version, but, the most coconut-y, by far. Loaded with shreds of coconut, which for me, gave a texture I didn't care for. I do like coconut, but, shredded coconut is always a challenge for me to actually like in most applications. Salted Caramel Waffle, August 2014. "Delightful pieces of caramel and a dash of sea salt." Sadly, I was out of town for July waffle Wednesday, so I missed that one. For August, the flavor was Salted Caramel. This was a pretty standard b. street waffle. Hot and fresh, right out of the waffle iron. Doughy and dense. I would have preferred a crisper exterior, but otherwise, nicely made. Inside were little tiny bursts of caramel. I loved the sweetness, but they were tiny, and there weren't many. The waffle itself wasn't very sweet at all. Powdered sugar on top helped it out, but I found myself wanting something sweeter, for the first time in a long time, I actually wanted some maple syrup or whipped cream or possibly even a caramel sauce, just some other topping, on my waffle. Salted Caramel Waffle, March 2015. The salted caramel strikes again! This time, I read my previous notes, and arrived prepared, armed with my own whipped cream (don't ask). It turns out, it was totally unnecessary. This waffle was awesome, as is. It was dense, doughy, moist, with a slightly sweet base. Inside were little bursts of caramel. I didn't pick up on much salt, but the caramel was certainly there. The powdered sugar on top was perfect for additional sweetness. Another one that I couldn't help but devour in seconds. This was a fantastic waffle! The bits of caramel were very well distributed and were far more flavorful than I remembered from past waffles. It was doughy and sweet, and really quite enjoyable. b. 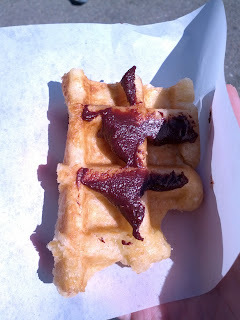 Street Waffles makes several different chocolate based waffles, like the chocolate raspberry I tried once. Historically, he used local TCHO chocolate (which I've reviewed before), but has switched to using Ghirardelli chocolate (yup, reviewed that too), as it is a deeper, richer taste. I'm not a big chocolate baked goods lover (not brownies, chocolate cake, etc), but I do love quality dark chocolate alongside my morning coffee, so I approached this one with skepticism. It was, well, chocolatey. Not as deep and rich as a brownie, but, clearly chocolate. It was studded with the same little caramel bits that go inside the salted caramel waffles, providing sweet little bursts of flavor. Topped with powdered sugar, I'll admit, this was a bit decadent for breakfast. With whipped cream added though, it would make a great dessert. I wasn't sold on the chocolate base though. Just not for me.